But the threat that Iran’s submarines pose to US aircraft carriers is no joke. Iran’s Ghadir submarines may one day field high-end Russian torpedoes, which pose a serious threat to aircraft carriers. But the threat that Iran’s submarines pose to US aircraft carriers is no joke, and it’s unlikely the US takes it as a joke. Then we see the destroyers accompanying the US carrier go down with deep booms and ripples one by one, until finally the carrier itself raises its bow out of the water and sinks. Two jets on the carriers’ flight deck scurry off at the last moment, possibly as an attempt at comedy. Finally, we see the triumphant Iranian submarine dragging the intact but sunken US ships behind it as a narrator boasts about Iran’s “very advanced” Ghadir-class submarines. Iran’s Ghadir subs take much of their design from North Korean submarines. The ships are small and powered by diesel engines that charge electric batteries that power the sub while underwater. The submarines are noisy and can’t travel far away from coastal waters. But in the Persian Gulf and the Gulf of Oman, Iran’s home waters, the simple Ghadir has many advantages. Brown or coastal waters are noisy and crowded, which dampens the US’s edge on listening. Also, small submarines such as the 95-foot-long Ghadir that know the topography of the sea floor can lurk undetected in small hiding spots a US submarine could never fit in. 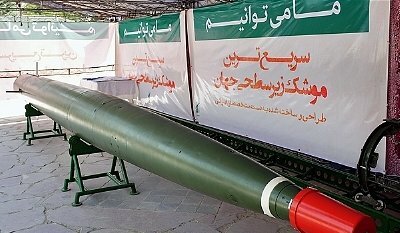 While the Ghadir itself isn’t that advanced, it’s been speculated that it could carry Russian-made supercavitating torpedoes. These torpedoes create a bubble of air around the hull that greatly reduces friction and can reportedly get them going at up to 200 knots. Compare that with the 30 knots a carrier can reach.